Single and tandem kayaks and paddle boards may be rented by the hour, full day, 24 hours, or for multiple days. Meet us at our Yelvik’s Beach location for hourly rentals. If you are renting for a full day or longer you can have your kayaks delivered to you or pick them up yourself. We offer complimentary straps and cushioning for your vehicle. Whether you launch from our beach or have them delivered we will help you choose a route, provide you with a map, life vest, paddle, and an emergency water pump for your safety. Before you begin we will discuss safety concerns, emergency plans, brief you on the Marine Mammal Protection Act, and go over any environmental or route hazards. On most days you may keep your return time open-ended. For off season rentals please call 360-301-6310 to make kayak rental arrangements. See rates below. During crabbing season you can rent a crab pot and let it soak while your enjoying your paddle. On your way back pull your pot and have crab for dinner! Fun for all age groups! 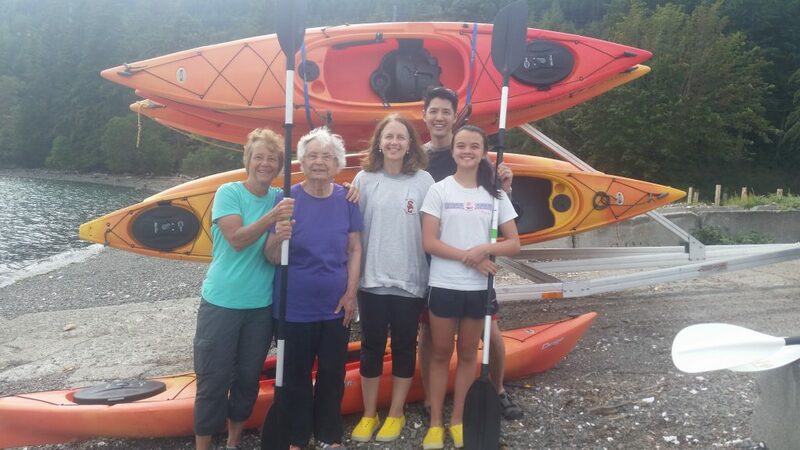 Four generations of paddlers in one family! ← Biologist Guided Kayak Tours!